One firmly, naturally notched into the other, here are tabular Arkansas doubly-terminated crystals with white tabular barnacle crystals. Tabular crystals are an uncommon growth habit - with improved communication ascribed to them. 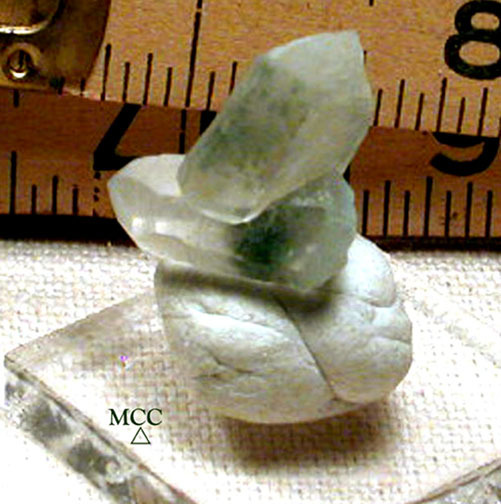 One crystal has a forest green chlorite phantom - rare - and several extra prism faces - the intergrown crystal has dotted, brighter green chlorite inclusions, and a frosty titanium tip. Overall they are 1/2 x 1" with a rare multi-color iris. Adorable AND super for healing work.